When a homoeopathic doctor with adequate training prescribes a homoeopathic medicine, he/she is able to predict the chance that the medicine will work for the patient, based on individual symptoms and the doctors’ prior experience with the medicine. Therefore, in homoeopathic context, symptoms are prognostic factors for the expected effect of a particular medicine., Prognostic factor research in Homoeopathy can be assessed by applying Bayes’ theorem which tells us how to use practical experience gathered from the past for new situations. It is based on the mathematical law of conditional probability – the probability that a homoeopathic medicine will work increases if a patient has a specific condition (symptom) indicating this medicine. Adding other symptoms indicating the same medicine stepwise increases the chance that the medicine will work. Chance = Odds/(1 + Odds). The target population, in this case, is the population where the specific medicine has a curative effect. The remainder of the population is the whole practice population minus the target population. From the formula, it becomes clear that the chance that a medicine will work if a specific symptom is present increases if LR >1, more so if LR is larger. On the other hand, if LR <1, the chance that the medicine will work becomes less. The calculation of LR is easy and can be done by making a 2 × 2 table of symptom present/absent and population cured by medicine/remainder population. A great advantage of this formula is that it represents the prevalence of a particular symptom instead of absolute occurrence. The existing system of adding symptoms to our Materia Medica based on absolute occurrence in provings or successful cases is obsolete because it will lead to many false entries in our repertories. By applying Bayes’ theorem, this shortcoming can be overcome and a better scientific identity is established for Homoeopathy. LR investigation is not yet recommended for medicines with infrequent occurrence in the population like rare remedies since it needs large populations. Nevertheless, attempts should also be made to assess LR of symptoms of lesser-known remedies on which the Central Council for Research in Homeopathy in India (CCRH) has been collecting research data for the past many years. Clinical verification is an ongoing research programme of CCRH that verified many rare homoeopathic drugs where the ‘symptomatology’ of these drugs is ascertained by assessing the symptoms improved during verification. CCRH has been conducting the drug proving programme since inception on healthy human beings. The symptoms of 20 lesser-known medicines out of many other medicines, which were proved in proving programmes, are here again clinically verified in patients under this programme. These data are collected after many years of research spanning the period (2007–2018) on patients. The study was conducted at 13 institutes/units of CCRH located at Noida, Uttar Pradesh; Shimla, Himachal Pradesh; Imphal, Manipur; Gudivada, Andhra Pradesh; Kolkata, West Bengal; Puri, Odisha; Lucknow, Uttar Pradesh; Guwahati, Assam; Tripura, Agartala; Bhubaneswar, Odisha; Patna, Bihar; Chennai, Tamil Nadu and Port Blair, Andaman and Nicobar. As per the inclusion criteria, the patients from all age groups and both sexes, having symptomatic similarity with the study medicines, and willing to participate were included in the study. If the patients were taking any acute medicine, they were included in the study after a washout period of 1 week. Exclusion criteria were patients unwilling to participate, patients having a clinical presentation not corresponding with the study medicines and patients on regular medication for any systemic disease. Ethical clearance for the study was taken from the Ethical Committee of the council. After providing patient information sheet in local vernaculars, informed written consent was obtained from the eligible participants or the guardians in case of minors before participation in the study. The study medicine was procured from a Good Manufacturing Practice (GMP) compliant homoeopathic pharmacy of India in various potencies, namely, 6C, 30C, 200C and 1M and was distributed to above-mentioned institutes/units. After recording the presenting signs and symptoms of the patients in case recording pro forma, the symptoms were repertorised using a repertory prepared for clinical verification by CCRH and then a specially developed Materia Medica was consulted for the final selection of the remedy. If the presenting symptoms of the case corresponded with the symptomatology of the trial medicine, then the medicine was prescribed in 6C potency and was repeated three times a day, till improvement/aggravation occurred when the drug was stopped; otherwise, it was continued for 5/7 days allowing the drug to act. Then, the subsequent potencies such as 30C, 200C and 1M were prescribed following the guidelines defined in the protocol. In cases of improvement under the action of any of the above-mentioned potencies, placebo was prescribed so far the improvement continued. If the improvement stopped, i.e., if the case relapsed or became standstill, then the prescription was repeated in the same potency. In no case, the same potency was repeated for more than two times. In cases where aggravation of the presenting symptoms resulted under trial without any relief, then change of medicine was considered. When new symptoms appeared after administration of the medicine, and if these new symptoms were mild and did not cause much concern to the patient, placebo was prescribed for 1 week. However, if no improvement followed or worsening occurred after 1 week, then change of medicine was considered. If the new symptoms were severe and cause considerable discomfort to the patient from the beginning, then change of medicine/therapy was considered at once. In cases where no perceptible improvement occurred after adequate repetition of medicine in different potencies, then it was searched for any obstacle(s) to cure and steps were taken to remove it (when identified) as far as possible. In cases where no response was achieved even after removal of probable obstacle(s), the case was referred for appropriate medical care [Figure 1]. The cases were followed up and assessed once a week or even earlier, if required. Each and every case has been evaluated in depth to find any known causative factors, the etiological factors and also any obstacle to recovery which may hinder the action of the drug, and once found, efforts were made to remove/minimise them. It appeared that the symptom ‘headache’ was recorded in only 20 out of the 50 medicine populations. Considering the high prevalence of this symptom, it is unlikely that this symptom would not be present in the other populations. The most likely cause of not recording the symptom seemed to be the fact that the symptom was not among the proving symptoms. This can be interpreted as recall bias, and therefore, the populations with missing data were disregarded, as explained in the ‘Results’ section. In group-confined LR (GCLR), the ‘whole population’ is confined to a group of the real whole practice population; in this case, the group responding well to 20 medicines. In the present study, the prevalence and GCLR of the symptom headache have been calculated for the 20 medicine populations with recorded data. For each medicine population, we observe a large number of disease diagnosis, clinical conditions and hundreds of symptoms representing them. It is important to realise that the LR values of a GCLR are valid only for patients with that symptom for the population represented in that research. It is a comparison of the involved medicines which is a relatively small number out of all homoeopathic medicines, and the selection is based on nascent research and expert opinion. If PFR is performed for a subpopulation, the outcome is valid for that subpopulation only. The GCLR thus assessed cannot be extrapolated to a larger population. For calculating LR and prognostic factor, MS Excel was used and MedCalc software had been used for calculating 95% confidence interval. The analysed CCRH data on 20 drugs comprised prescription data on 20 drugs, (N) total = 4582; (N) Headache = 859 (18.74% of total). The total number of improved patients was 3929, 777 (19.8%) of them had headache. This main complaint is a prognostic factor for the success of respective medicines and is in this context considered as homoeopathic symptom. Calculating the GCLR value for the symptom ‘headache’ for the medicine, Allium sativum rendered the following 2 × 2 table and result [Table 1]: LR= (85/136)/(774/4446) =3.59. there were 136 cases responding well to Allium sativum in this database, i.e., 2.96% of the whole (confined) population of 4582. 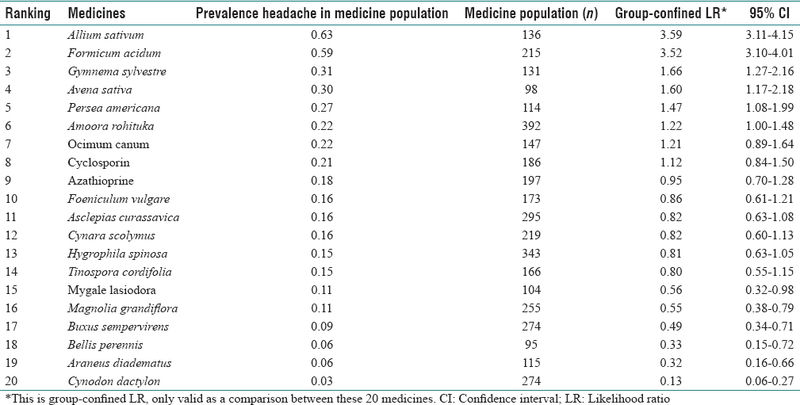 [Table 2] shows the prevalence of ‘headache’ in each medicine population. It shows that the population responding well to Allium sativum has the highest prevalence of headache (63%), followed by Formicum acidum (59%) and therefore also the highest GCLR. The lowest prevalence of headache is seen in the population responding well to Cynodon dactylon (3%), indicating a relative contraindication for Cynodon dactylon in case of headache. Following the prevalence in [Table 2], we can make a ranking order according to LR of the 20 medicines in this table, if headache is present. This ranking order is just a vague indication of what medicines to prefer out of these 20 if headache is present. However, this would suggest data comparability with other medicines outside this group that is not warranted. It is therefore better to call this ‘LR’ as ‘GCLR’ to avoid confusion about the meaning of this ‘LR’ value. [Figure 2] shows the graphical representation of the prevalence of headache in various populations. After a programme for the evaluation of a group of 50 lesser-known medicines by CCRH, data about the prevalence of the symptom ‘headache’ were available for 20 medicines. According to Bayes’ theorem, the higher the prevalence of a symptom in a population that responds well to a specific medicine, the higher the chance that this medicine will work if the symptom is present in a new patient. This enables us to rank different homeopathic medicines according to the predictive value of a specific symptom. In this evaluation, the prevalence of the symptom headache varied from 3% for the population responding well to Cynodon dactylon to 63% for the population responding well to Allium sativum, as shown in [Table 2]. In total, 8 of the 20 medicines had a more than average prevalence of headache but only 2 stand out: Allium sativum and Formicum acidum. These medicines could be related to headache. We calculated ‘group confined’ LRs to indicate what medicines had more than average prevalence of headache, but we stress that these LR values are only valid in the comparison between these 20 medicines, they cannot be used in the comparison with other medicines and these LR values should not be transposed to the repertory rubric. Reliable prognostic factor research should be prospective, checking the well-defined symptom, in this case, ‘headache’ in every consecutive new patient. This evaluation programme was not designed as prognostic factor research, resulting in significant shortcomings if we try to interpret the data. First, the selection of a medicine was based on the presence of at least two proving symptoms. Therefore, the validity of the data of this programme depends on the validity of the proving and the limited number of persons participating in the proving. In the programme, 50 medicines were tested, but only 20 had data about headache. It is unlikely that the other medicine populations had no patients with headache. Therefore, we cannot make any conclusions about the prognostic value of ‘headache’ for the other 30 medicines. Second, the design of the study induces confirmation bias; if there is no headache in the proving, the medicine is less likely to be selected. Therefore, we cannot say that the symptom headache excludes the 30 other medicines. Third, many symptoms, also headache, have a variety of intensities, and for research purposes, a cutoff value for each symptom should be defined, like ‘more than once a week', and possibly, also the intensity of headache. A well-defined cutoff value offers the possibility of comparing a prevalence in different populations. It would have been interesting to compare the prevalence of headache in the Allium sativum population with, say, the Natrum muriaticum population. A mean prevalence of headache of about 20% for this whole population with data present does neither indicate a very high nor low cutoff value. This prevalence is not very different from a prevalence of 14% found in literature. Fourth, this research did not have clear assessment of causal relationship between prescribed medicine and improvement. There was a mix of acute and chronic cases. In acute cases, many improvements are due to spontaneous recovery. This is less in chronic cases; but here, there could be ‘regression to the mean': many diseases have fluctuating intensities and patients consult the doctor if the intensity is at the maximum. After that moment, the complaint becomes less just because of the fluctuation. This kind of improvement cannot be ascribed to the treatment. With the caveats mentioned above in mind, however, we conclude that the symptom headache could indicate the medicines Allium sativum and Formicum acidum, based on more valid criteria than before. Possibly, headache is a relative contraindication for Aranea diadema, Bellis perennis and Cynodon dactylon, but this should be confirmed by properly designed PFR. This research could also be used to validate the proving methodology. In this research, data from a former clinical verification programme were re-evaluated from a prognostic point of view. 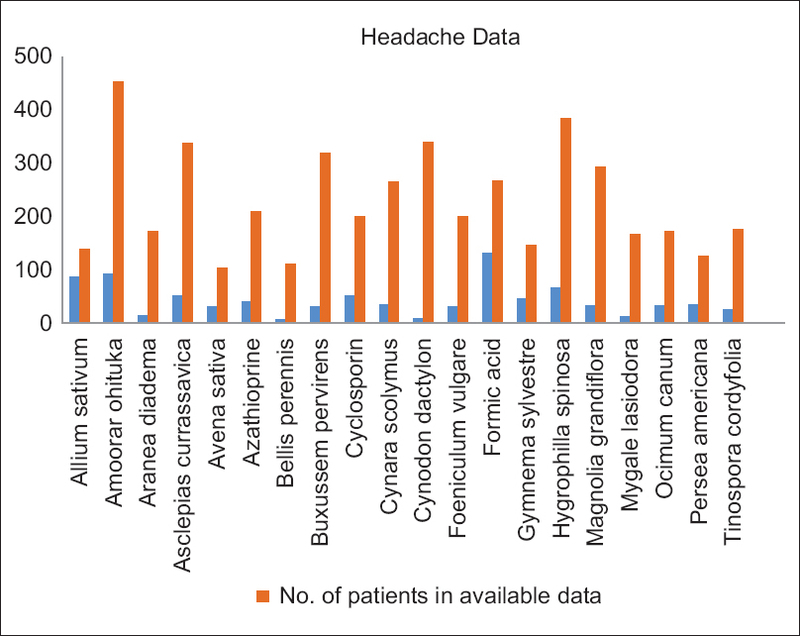 Because of missing data concerning the prevalence of the symptom ‘Headache', we could only analyse the prevalence of headache in only 20 of 50 medicine populations. The validity of this retrospective analysis could also be influenced by confirmation bias and insufficient assessment of the causal relationship between improvement and the prescribed medicine. The ‘GCLR’ values we found cannot be as such transposed to the condition ‘Headache’ because other medicines were not prescribed in this programme. For future evaluation of all medicines related to headache, Allium sativum and Formicum acidum are worth considering. The authors sincerely acknowledge Dr. Chaturbhuja Nayak, Former Director General, CCRH and Dr. Anil Khurana, Deputy Director General, CCRH for their contribution in monitoring of project during the study. We are thankful to all programme officers of the Institutes and units, where project was going on, for their administrative support. We are thankful to Sh. Arvind Kumar, Statistical Assistant, CCRH, for his help in statistical analysis of the study. Last but not least, we are thankful to all the patients for their participation in the study. This study was financially supported by Central Council for Research in Homoeopathy. Miglani A, Rutten L, Manchanda RK. Generalisability of prognostic factor research: Further analysis of data from the IIPCOS2 study. Homeopathy 2017;106:155-9. Hemingway H, Croft P, Perel P, Hayden JA, Abrams K, Timmis A, et al. Prognosis research strategy (PROGRESS) 1: A framework for researching clinical outcomes. BMJ 2013;346:e5595. Riley DR, Hayden JA, Steyerberg WE, Moons MG, Abrams K, Kyzas AP, et al. Prognosis research strategy (PROGRESS) 2: Prognostic factor research. PLoS Med 2013;10:e1001380. Rutten AL, Stolper CF, Lugten RF, Barthels RW. Assessing likelihood ratio of clinical symptoms: Handling vagueness. Homeopathy 2003;92:182-6. Van Wassenhoven M. Towards an evidence-based repertory: Clinical evaluation of Veratrum album. Homeopathy 2004;93:71-7. Rutten AL. Bayesian homeopathy: Talking normal again. Homeopathy 2007;96:120-4. Stolper CF, Rutten AL, Lugten RF, Barthels RJ. 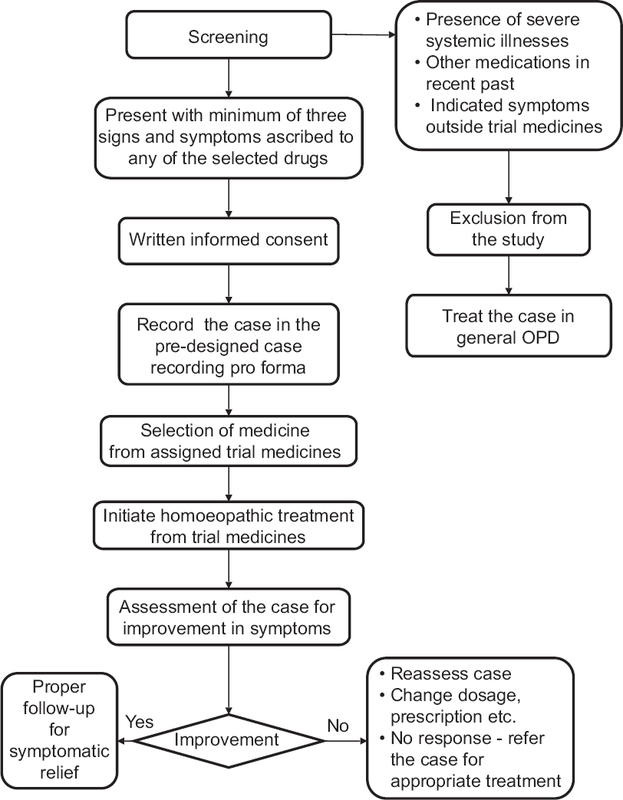 Improving homeopathic prescribing by applying epidemiological techniques: The role of likelihood ratio. Homeopathy 2002;91:230-8. Rutten L. Prognostic factor research in homoeopathy. Indian J Res Homoeopath 2016;10:59-65. Eizayaga JE, Pozzi MI, Canan MC, Saravia L. Prevalence and likelihood ratio of symptoms in patients with good therapeutic response to Lycopodium clavatum. A retrospective study. Homeopathy 2016;105:78-83. Ray BK, Paul N, Hazra A, Das S, Ghosal MK, Misra AK, et al. Prevalence, burden, and risk factors of migraine: A community-based study from Eastern India. Neurol India 2017;65:1280-8.